Don’t mess with these guys because they start training before they start talking. Tiny ninjas have their own toys that instill sense of the ninja community from the very young age. This Matryoshka Madness!™ set of six nesting Ninjas is one of them! Made from high grade ABS material with superb graphics! These nesting dolls have been approved in an independent study by the National Lekotek Center as very suitable for children with special needs! Older ninjas get a chance to develop their strategic and tactic skills staging battles and getting past the obstacles to defeat their evil adversaries. 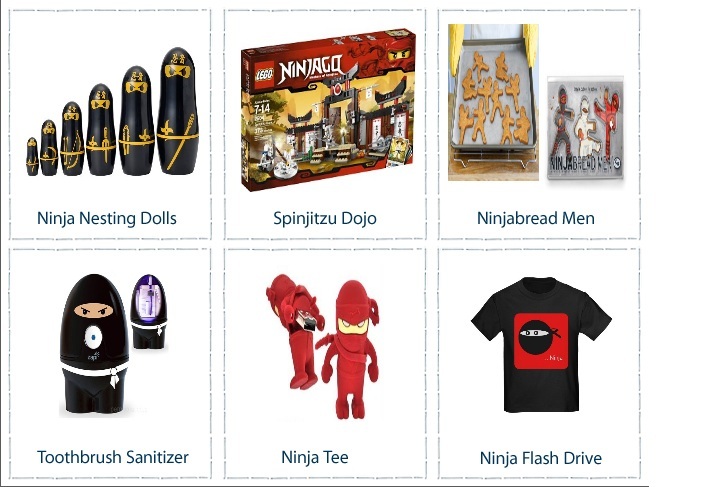 Lego + ninjas = one very happy child; clever way to satisfy two obsessions with one gift. Get some action into your kitchen! These ninja warriors are here to take over your cookie cutters town. They sure will disappear the moment they emerge from the oven. Food-safe ABS plastic. Comes packaged in a colourful gift box. Now, he needs to get some teeth brushing action after fighting and successfully defeating all these cookie ninjas. And here comes the bathroom Ninja to fight germs and bacteria! ZapiPOP™ Hi-Ya Ninja Toothbrush Sanitizer uses germicidal ultraviolet light to kill 99.9% of germs on your toothbrush in just minutes. You won’t have to remind him to sanitize his tooth brush. All it requires is to insert the toothbrush, press the button, and … good bye germs! The sanitizer goes to work, turning off automatically. Your toothbrush head is germ free and safely stored inside ready for the next brushing action! Actually, it’s not a good idea to tell ninjas they are cute. Because they are terrifyingly cute! Score some major points with the ninjas of all ages with this deadly cool assassin. His legendary storage powers had earned him an utter respect of his enemies.